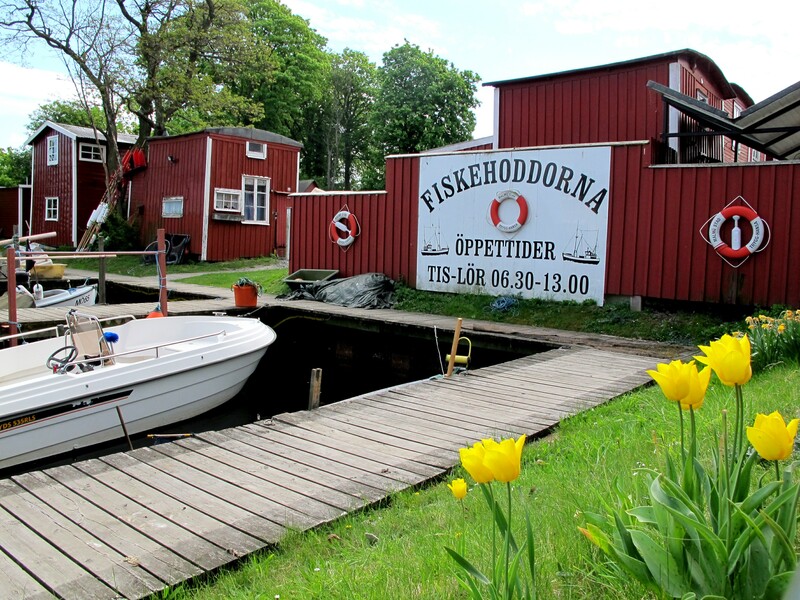 One of the first places I visited after moving to Malmö was the fiskehoddarna (fish huts) next to the Tekniska Museet and Sjöfartsmuseet (Technical Museum and Seafaring Museum). 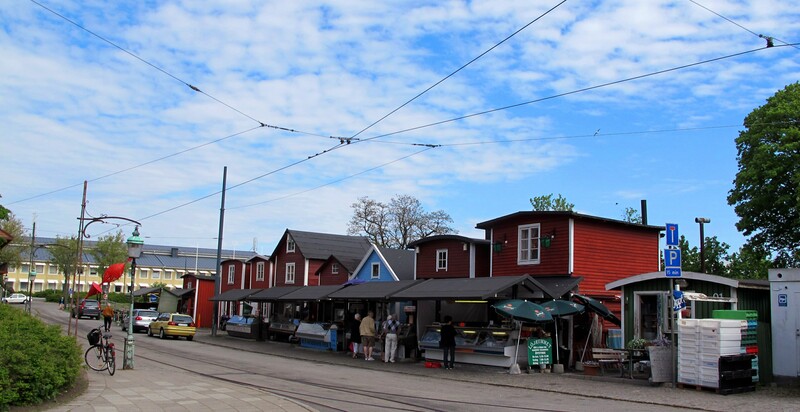 They are a charming row of historic fishing huts that were moved to this location in 1956 when the once flourishing Malmö fishing industry was sinking and a group of remaining fisherman donated their huts to the Sjöfartsmuseet. 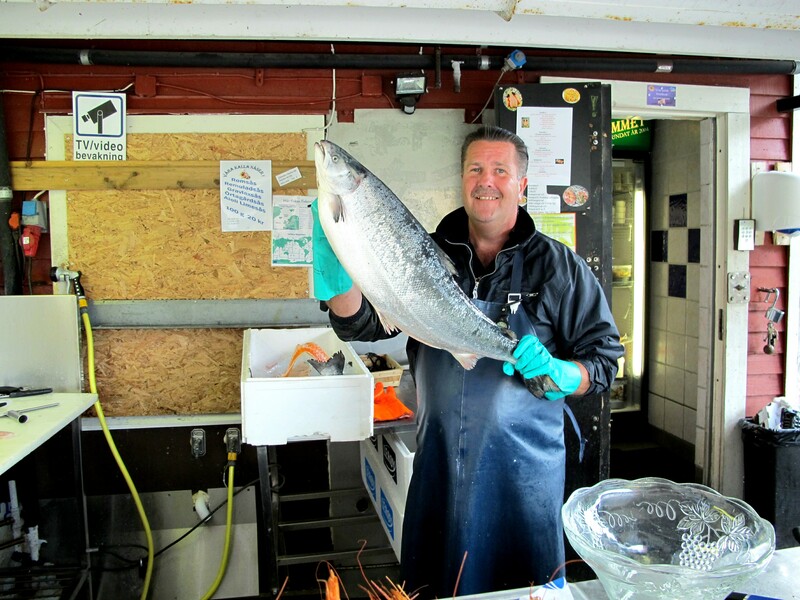 Today you can find a variety of fresh fish and shellfish here as well as pickled herring and smoked specialties like eel and mackerel. Some of the huts clearly offer their own recent catch of slippery, thrashing eels, and gasping rödspätta (European plaice) while others have a local mix as well as selections like sea bream and langoustine that are not from this region. I love to stroll the various cases and see what I can find, but the one thing I come back for on a regular basis is the varmrökt lax (warm-smoked salmon). It’s a Swedish specialty and if you have heard the saying ‘bacon is meat candy,’ I contend that varmrökt lax is salmon candy. 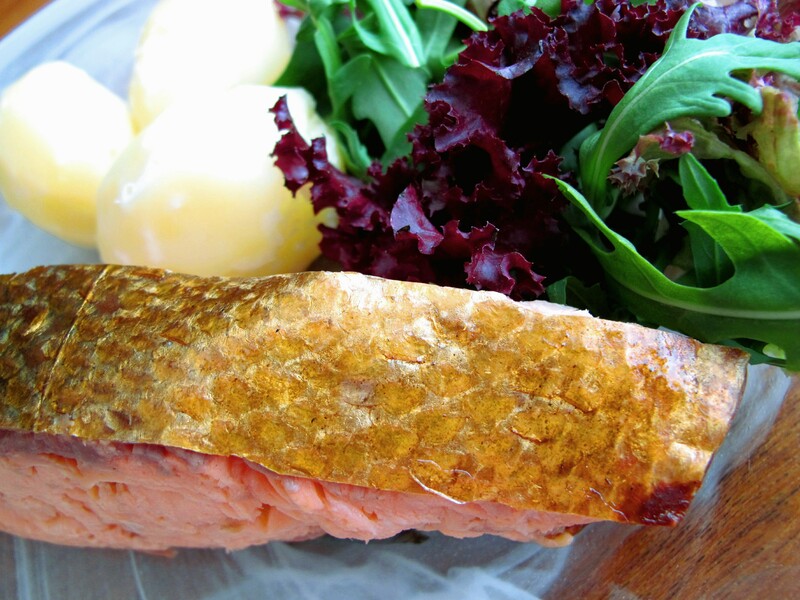 The soft flakes of subtly alder wood smoked fish nearly melt in your mouth. It’s even difficult to cut slices off of the big fillets without marring them because the texture is so delicate. Not only is the flesh of the fish picture perfect pink, but the skin turns a glorious golden color during the smoking process. The vendor I keep going back to for this treat is Löjromet, the first hut in the row, right on the corner. At Löjromet they have been smoking their own salmon on-site since 2004 and the owners Linda, Lars, and Lars are some of the nicest people you could meet. I have been a customer here for over three years and each time I come to their stand it’s a pleasure. I popped in on a day when they were doing their smoking, mentioned I was starting a blog, and asked for a bit of information about the process. They readily led me back to the smokehouse, happily answered my questions, and even invited me for a cup of coffee. So here is a little bit of information about the process at Löjrumet. 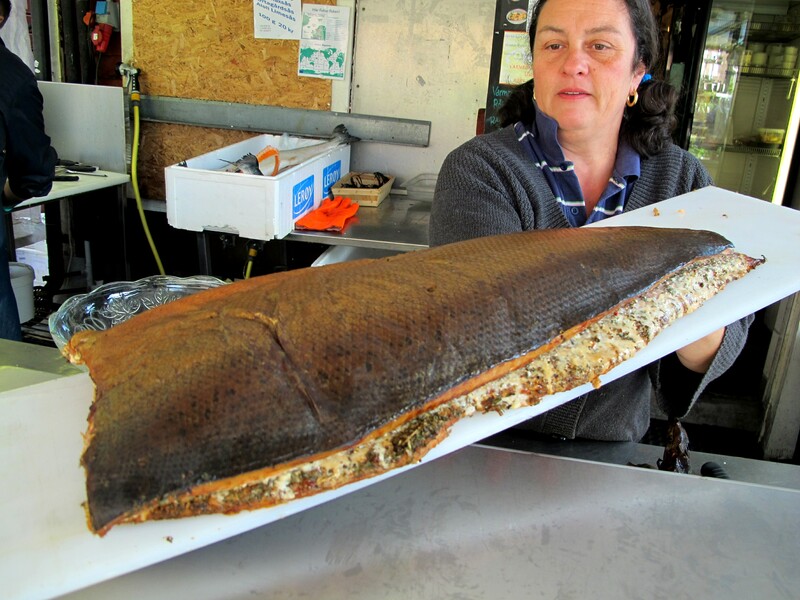 They start with farm-raised Norwegian salmon and alder wood in both the form of logs and chips. 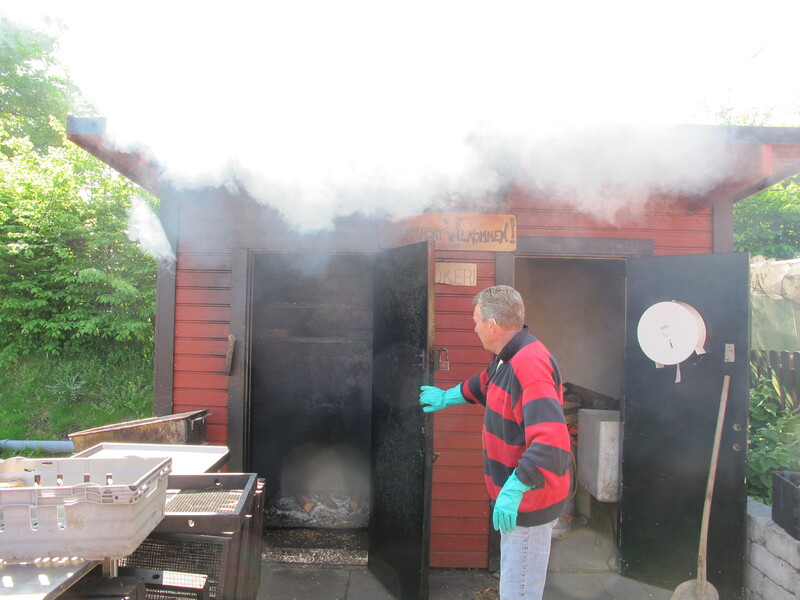 On smoking days the smoke house is fired up around 7am and the entire process takes 5 to 6 hours. 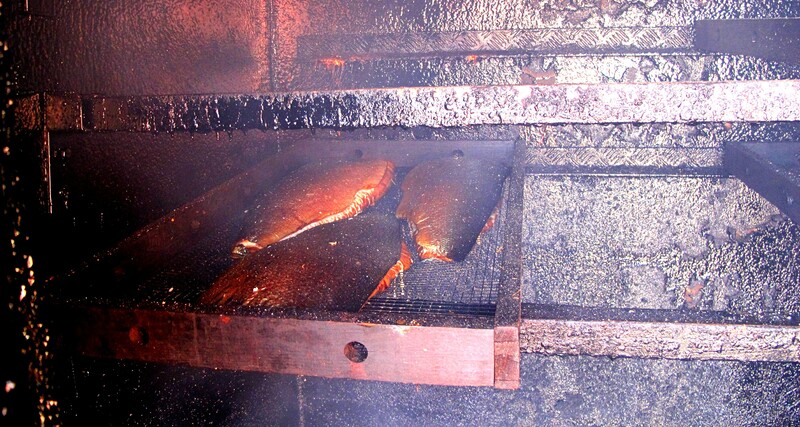 Each smoker has their own way of completing the process but the temperature in the smokehouse is held between 70-80°C (158-176ºF) and the smoke is stoked as needed until the fish reaches a temperature of 59-60°C (138-140 F). When I was there, they were smoking an orange/lemon/leek version as well as the naturell (natural). Other flavors they smoke include herb, lemon-pepper, tomato-chili, and pesto. They don’t have all of the flavors on a regular basis, so if you want to special order it’s best to do that on a Tuesday when they open for the week. Another treat they were busy smoking is whole shrimp. Of course the shrimp smoke much more quickly, in about 45 minutes, but they are done in the same smokehouse along with the salmon. Talk about little bites of smoked heaven. These are a dream simply served on a triangle of bread fried in butter to a golden brown in a stovetop skillet. 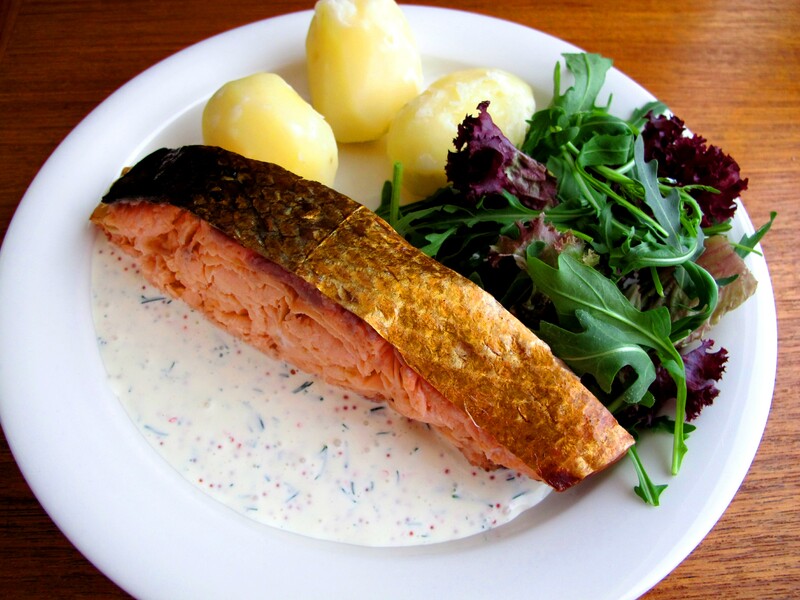 As a main course, the varmrökt lax is typically served with boiled potatoes and romsås (caviar sauce). Cooked peas or simple mixed greens drizzled with extra virgin olive oil work nicely on the side. As a starter, the varmrökt lax can be served on butter-fried toast and topped with some of the romsås. This versatile sauce is a common Swedish accompaniment to varmrökt lax (warm-smoked salmon) and is a cinch to make. It has many other uses too. Try it on the classic Swedish räksmörgås (open-faced shrimp sandwich), on a shellfish or salmon-topped baked potato, or tossed with hot pasta such as fusilli with capers, and flaked varmrökt lax. 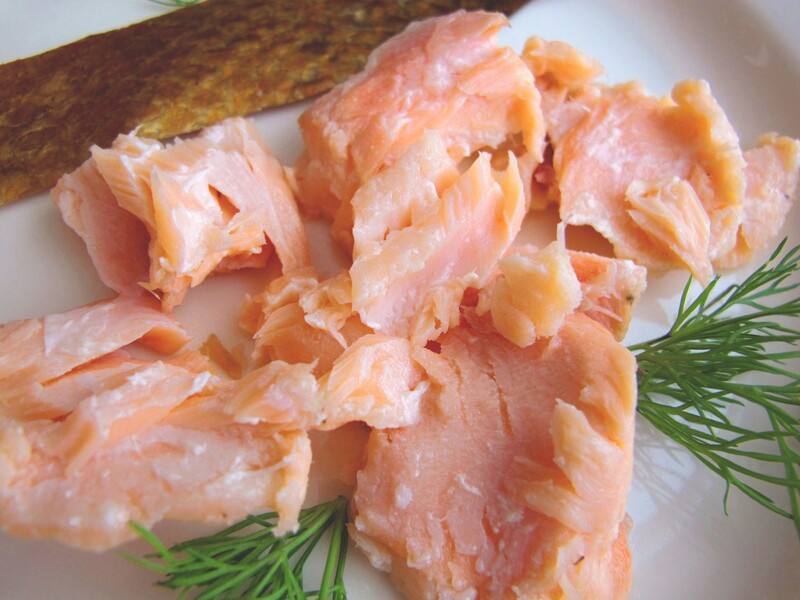 If you can’t get your hands on the varmrökt lax for the pasta, you can use the raw smoked salmon or gravad lax that that can be found in many supermarkets. Blend all of the ingredients and serve as an accompaniment to fish or shellfish, use it to top baked potatoes, or toss it with hot pasta. Cheddar cheese on crackers with orange marmelade or apricot jam, is one of my all time favorite snacks! It is best with Sharp cheddar. I never knew of this combination until my brother in law (who is from Sweden) introduced me to it. Everyone should give it a try! Sending many thanks for nice pictures of Löjromet and us. Hope too see you soon on fiskehoddan. Thank you very much for your note about Varmrokt Laks. I just returned from Norway and savored it in a memorable last meal in Oslo, I was wondering just how it was made. I might buy a smoker just so I can make it myself. Would you know if they brine the fish before smoking? The domestic recipes I have seen seem to call for brining. The one I had in Norway was a PepperLax, seasoned the way I would make gravlax. haven’t had the courage to try cooking the fresh eel yet, but I love the fiskehoddarna. probably wise for me to buy a smoker while everyone is away on holiday.